A rectangular blued-steel casket overlaid with gold patterning of scrolling foliage. The casket has a convex body, lobed in relief on all sides and the lid is overlaid with a Persian inscription in gold. This method of applying gold to steel is known as kuftkari. The technique had historically been used to decorate arms and armour but was later used to embellish objects intended for the European market such as caskets and jewellery. 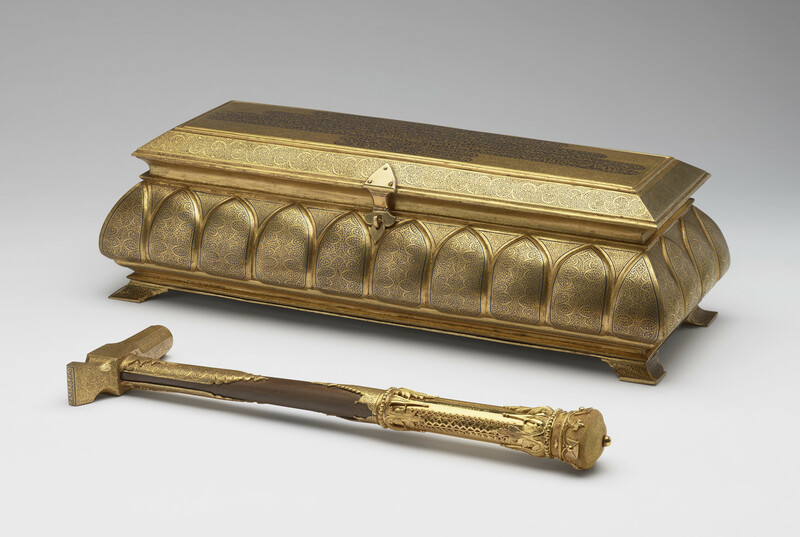 The casket contains a wood and steel hammer, also decorated using kuftkari and gold mounts inscribed with a dedication to Albert Edward, Prince of Wales. The hammer terminates with a vice-regal coronet. The casket and hammer is accompanied with three silk scrolls, each of them printed with the English translation of the Persian inscription on the lid of the casket and a copy of the inscriptions found on the hammer.